The Himalayan is known for its great beauty, "people oriented" demeanor and gentle disposition. 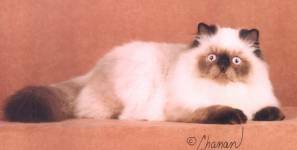 Developed in the 1930's by crossbreeding Siamese and Persians, the Himalayan evolved into a pointed, longhaired, blue-eyed beauty. 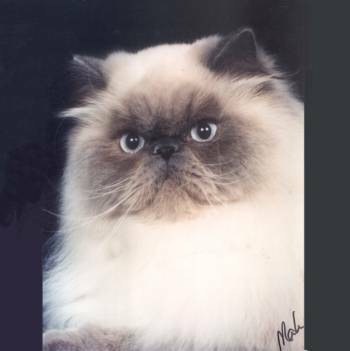 In 1958, the then four-year-old ACFA became the first North American registry to accept Himalayans for championship competition. Their large, round eyes and plush coat can only be outdone by their loving personality. They want to be with their people whenever possible and will often "help" with whatever you are doing, from cooking, reading the paper, working on the computer, to watching TV. Although playful by nature, the Himalayan is not known to climb your drapes or jump to the top of your refrigerator. After even a short absence, more often than not, your best friend, the Himalayan, greets you at the door. The "Himmy" comes in a variety of colors: Seal, Chocolate, Blue, Red, Cream, Seal-Tortie, Blue-Cream Tortie, Lilac, and even Lynx points as well as solids! Although they have the color points and blue eyes of the Siamese, they certainly are not longhair Siamese. That distinction belongs to the Balinese. Nor are they Persians, even though their appearance is similar. In ACFA, the Himalayan is a stand-alone breed. 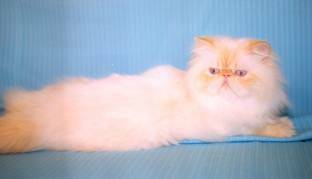 The Himalayan kittens are generally white when they are born. The gene that gives them their color is sensitive to heat, so the cooler the body, the more color you see. Newborn kittens are kept very warm, but as they grow accustomed to the air around them, the tips of their ears and tail start to darken. Gradually, the point color appears on the tail, legs, feet, ears and front of the face (referred to as the mask). Daily grooming is necessary, but usually takes only a few minutes and the end result is certainly worth it. So, enjoy your Himalayan. It is a proud, beautiful aristocrat, developed with and for love!